The Comcast Foundation and Philadelphia Mayor Michael A. Nutter honored two local students with the Gus Amsterdam Leadership Award at the Greater Philadelphia Chamber of Commerce’s annual Mayoral Luncheon. 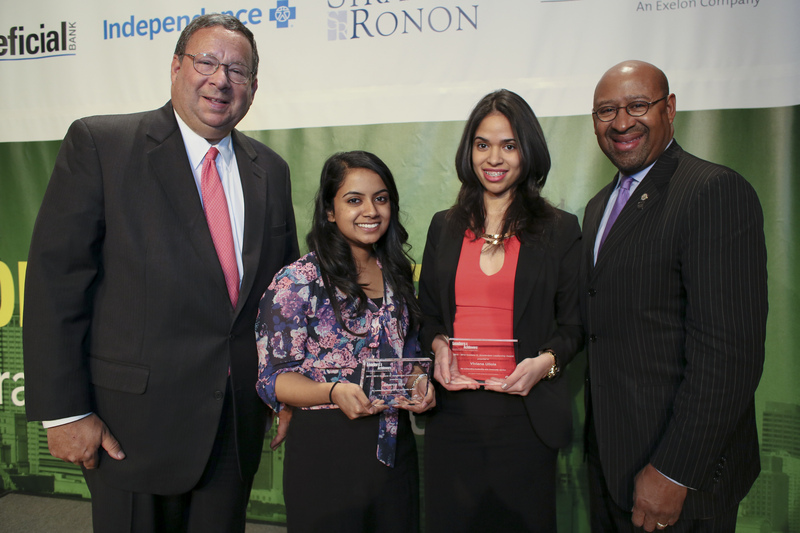 Comcast Executive Vice President David L. Cohen presented Sharon Roy and Viviana Ullola with individual $5,000 scholarship awards at the luncheon. Finalists for the Gus Amsterdam Leadership Awards are chosen from the winners of the Comcast Foundation’s Leaders and Achievers scholarships. The nationwide Leaders and Achievers® Scholarship Program recognizes students for academic achievement, leadership skills and a commitment to community service. The Gus Amsterdam award targets students who attended public high school in Philadelphia and are continuing their education at a college or university in the city. Gus Amsterdam was a Philadelphia business leader, community advocate, and founding board member of Comcast Corporation. He dedicated much of his time and energy to the community, and to improving education. A graduate of Central High School and the University of Pennsylvania, Gus was committed to civic and educational activities in Philadelphia throughout his life.